When it comes to learning about the visual power of lines, Emily Carr is a master. Her paintings are characterized by fluid swirling lines that express direction and movement. Direction, that's what I'm after, everything moving together, relative movement, sympathetic movement, connected movement, flowing, liquid, universal movement, all directions summing up in one grand direction, leading the eye forward, and satisfying. So to control direction of movement that the whole structure sways, vibrates and rocks together, not wobbling like a bowl of jelly. From a design and composition viewpoint, one of the most important lines to appreciate is the line of the horizon. A horizontal line separates the earth from the sky and offers us not only a place to stand, but also a starting point from which we can step forward. Horizontal lines speak to us of width, breadth and vastness, yet they are comforting in their stability. As a dividing line with the sky, horizontal lines offer us perspective: a high horizontal line provides a focus on the earth, whereas a low horizontal line directs our attention to the sky. Horizontal lines calm us with feelings of security, balance and control. Once we’re comfortable and stable, we can step forward onto the pathway of our quest and the leading line is that pathway. From the outer edges of our quest, leading lines take us diagonally, or obliquely, to the heart or our image. 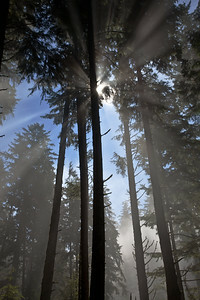 Vertical lines are tall grasses and tree trunks looming up and out of the mist, aspiring to the sun. With vertical lines, we soar. They attract us with feelings of strength, power and grandeur and lift our spirits up into new realms. Lines that converge add depth and a sense of scale to our view. They are a measure of our distance from the horizon and are one of the ‘wow’ factors of our quest. Wow, we have a long way to go. Wow; I am such a small part of the vast and enormous cosmos. In 1840, on seeing a large canvas ball constructed for the 4th of July celebrations, Henry David Thoreau the philosopher and naturalist wrote in his journal, ‘the line of beauty is a curve’. Such lines are fluid, rounded and feminine. 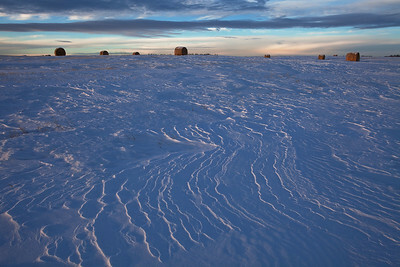 Soft snow banks, clouds, flowers and tall grass rounded by heavy seed heads, speak to our emotions through curved lines. They allow us to connect to feelings of grace and beauty and move us with a sensuality that other lines cannot. The S-curve is one of my favourites. It’s a meandering river or a stone pathway through a Zen garden. It provides us with permission to wander and take all the time we need on our quest. The S-curve is a stroll, a meditation and contemplation that allows us to ponder the hidden gems that await our discovery. Lines are colors and shadows that speak to us visually of movement. They attract and focus our attention offering us the opportunity of learning a deeper way of seeing. Lines express the power of movement. Click on an image to start a full screen slide show. 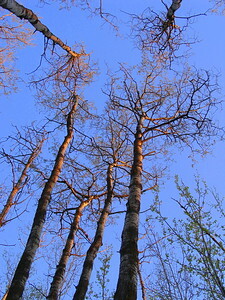 The title comes from an Emily Carr painting ‘Scorned for Timber, Beloved of Sky’. What a powerful phrase, beloved of sky. 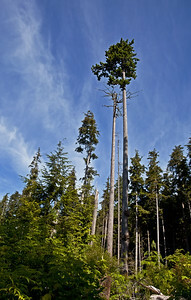 Photograph from China Beach, Vancouver Island. Vertical Lines are sunflowers and tree trunks, looming up and out of the mist, aspiring to the sun. They attract us with feelings of strength, power and grandeur and lift our spirits up to the heavens. 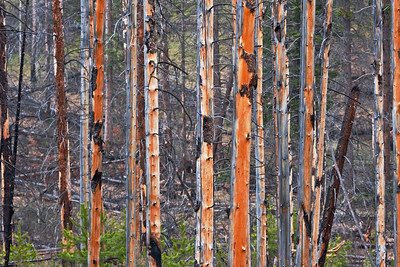 Vertical lines of burnt timber. Bow Valley Parkway, near Banff, Alberta. The orange colours invite us to pause and consider, while the purple / grey of the background stimulates our imagination. What does it all mean? And, vertical lines can lead us down. 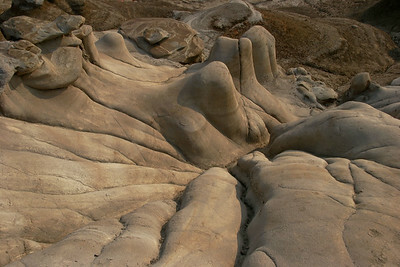 The Hoodoos, near Drumheller, Alberta. Vertical lines leading us in and up. 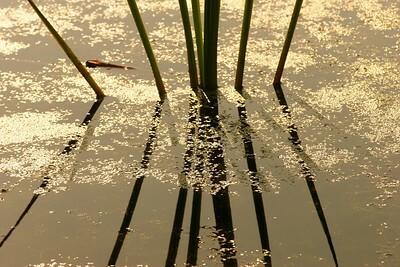 The duckweed adds a texture to this image and notice how the reflected lines are a different angle than the shadow lines. Horizontal lines calm us with feelings of stability, balance and control. They give us a place to stand, but also a place from which we can step forward. 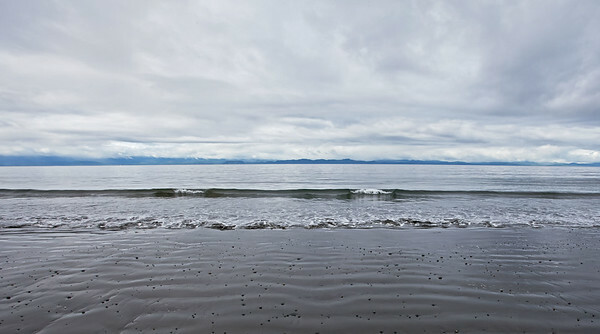 - Sandcut Beach,Vancouver Island. Converging lines create a perspective of distance. 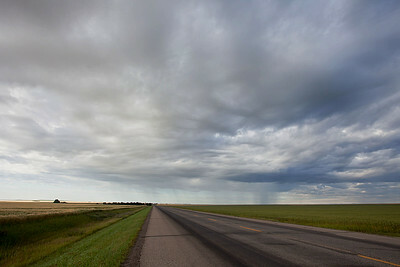 - Near Vulcan, Alberta. Oblique lines provide action and direction. They carry us through an image. Puerto Vallarta Mexico. The clouds form one set of oblique lines and the mountain ridges form another. 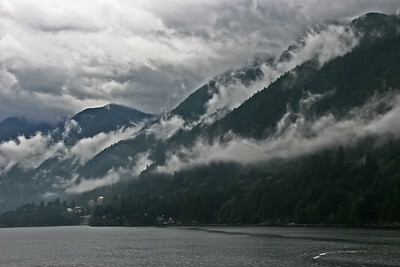 Horseshoe Bay, Vancouver, B.C. 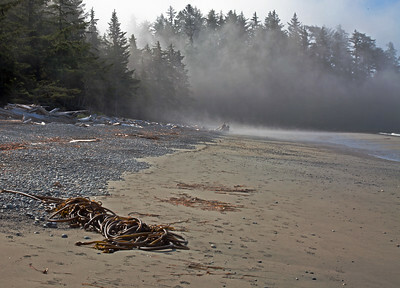 There is perpetual mist at the south end of French Beach. The strong diagonal line in this photograph leads us on a stroll along the beach, half sand and half rocks, towards …something, a stump or a structure half hidden in the mist. As we get closer we can see that it’s a drift log lean-to. Is someone sleeping there? Are we intruding on young lovers in the mist? The diagonal line pulls us along, into the mystery. Speak to us with the sensuality of the goddess. They move us with a sensuality that other lines cannot. 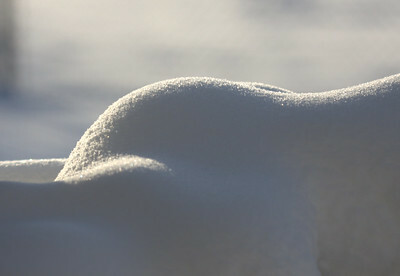 - Snowbank, Sherwood Park, Alberta. 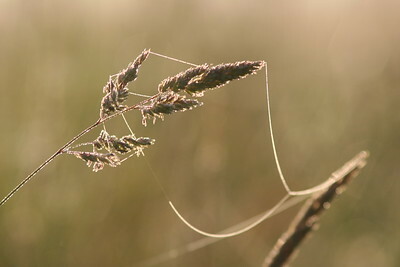 The curved line of a spider's web adds a sensuality to this photograph. 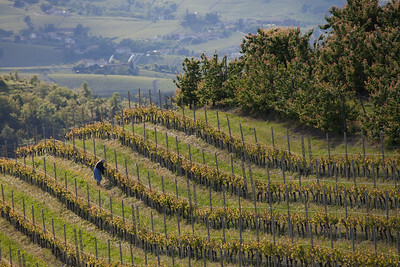 A woman tends her vines, near Alba, Italy. 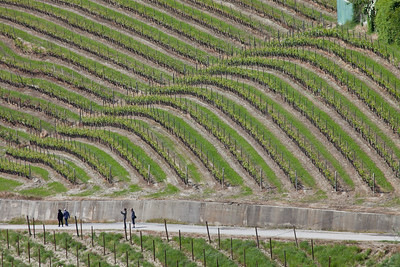 Vineyards near Alba, in Italy. The S curve winds us through an image, allowing us to explore. 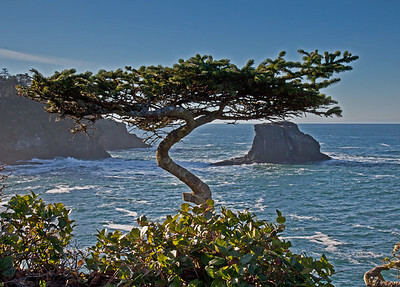 Cape Flattery, Washington State. 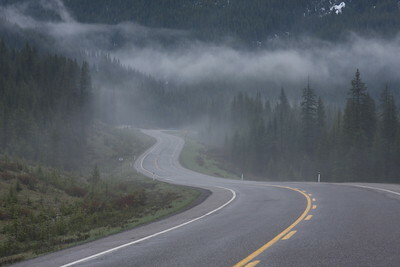 The S-curve is a mountain highway or a stone pathway through a Zen garden. It provides us with permission to wander and take all the time we need on our quest. - Highwood Pass, Alberta. 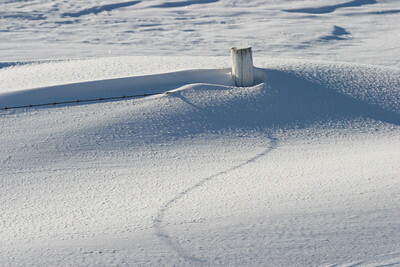 Low winter light creates and S curve shadow on the snow. - Wabamun Lake, Alberta. Reversed S curves lead us up to the hay bales on the horizon, adding texture to the foreground in this photograph.